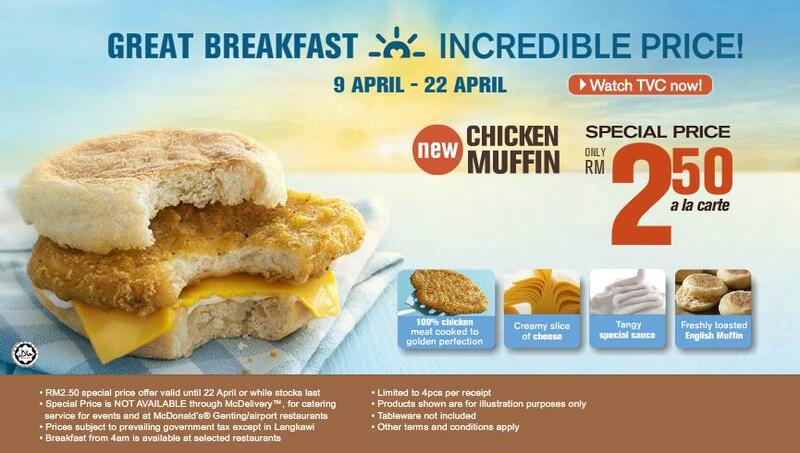 While the Weekday Breakfast Specials had been slightly revised to almost RM4.70 for all in recent months, this is definitely a good reward for their loyal fans or breakfast lovers like us. In fact, we did grab this on the first morning touching down Malaysia @o@. In fact, I personally feel that the portion especially the patty is just as big as the illustrated, which will be bursting out of the english muffin for real this time! This entry was posted on Thursday, April 12th, 2012 at 3:14 pm	and is filed under Fast Food, Food Promo, Set Breakfast. You can follow any responses to this entry through the RSS 2.0 feed. You can leave a response, or trackback from your own site.